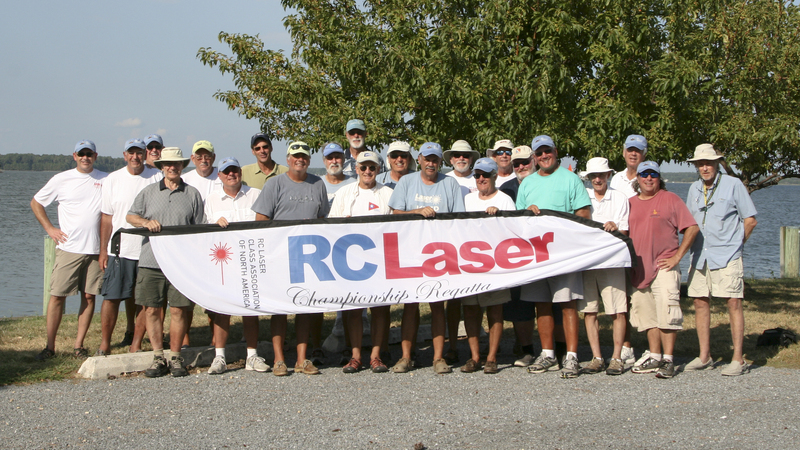 Twenty three RC Lasers showed up on a Wednesday for part one of the Tilghman Trifecta series of regattas held at the beautiful Tilghman on Chesapeake Yacht Club in Tilghman, MD. Part two was the EC12’s and part three, the Star 45’s, would follow over the next four days. Regatta Chairman Dave Branning couldn’t have picked a better day. The wind was a strong B sail for the morning seeding races and all but a few skippers hoisted their C sails for the rest of the day. It was a day that called for lots of liquid as the temperature was in the low 90’s. The regatta drew skippers from MD, NJ, NC, PA, MI, and FL, with some staying for the other two regattas. One family had four members competing: brothers Steve Lippincott, Skip Lippincott, Tom Lippincott, and brother-in-law Nick Mortgu. After the fleet was split up by the Mason Dixon Line the six seeding races began. RD Danny Thomas did an excellent job on choice of course and keeping the races going on this hot day. After each of the two fleets finished seeding we adjourned to the welcomed air conditioned Tilghman Club for a deserved rest and lunch. Afterwards, to all our surprise the wind had picked up enough to change to C sails. Sailing in the Chesapeake Bay in salt water required extra care in keeping your boat cockpit dry. There were more than a handful of mystery electronic problems during the day, including one battery fire in Cape May Ray’s pocket! In the gold fleet, RC Laser National Champion Dave Brawner sailed flawlessly to a 13 point first place and was awarded the Jim Karr Trophy, followed by Roger Vaughan with 20 points and regatta chairman Dave Branning, placing third with 38 points. Rick Ferguson sailed one of his best regattas and placed fourth with 41 points. The silver fleet is always the fleet to watch as these skippers are sailing against their peers for a separate set of awards. First place went to Oxford fleet’s Roger Baldwin with just 34 points. Bob Roe, another Oxford Sailor, finished second. Jersey Boy’s Harry Mote and Cape May Ray Szulczewski finished third and fourth. This was Ray’s first walk to the RC Laser trophy stand. Extra thanks goes to Regatta Chairman Dave Branning, RD Danny Thomas, Girl Friday Elaine Hepkin, who registered us, fed us, rescued our boats and tallied the scores, and part time scorer Beth Lippincott. to RC Laser skipper Ryan Lippincott for winning the Star 45 National Championship!